3 is the smallest odd prime number. 3 is the only number that equals the sum of ALL the counting numbers less than itself. Prime factorization: 3 is prime. The exponent of prime number 3 is 1. Adding 1 to that exponent we get (1 + 1) = 2. 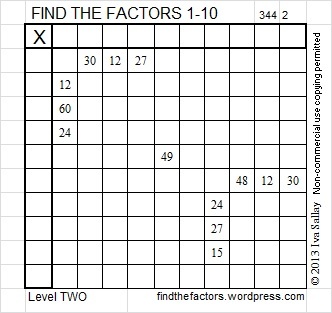 Therefore 3 has exactly 2 factors. 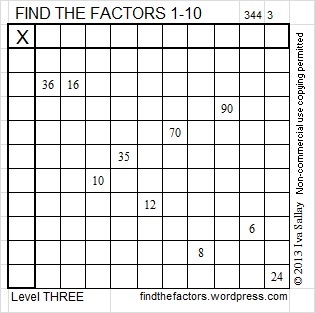 3 has no square factors that allow its square root to be simplified. √3 ≈ 1.732. How do we know that 3 is a prime number? If 3 were not a prime number, then it would be divisible by at least one prime number less than or equal to √3 ≈ 1.7. Since there are no prime numbers less than or equal to 1.7, we know 3 is a prime number. 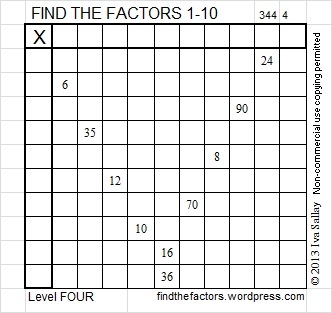 When 3 is a clue in the FIND THE FACTOR puzzles, the factors are always 1 and 3. 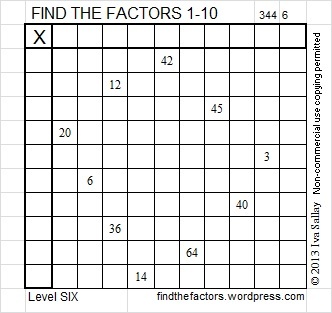 Click on this link, 10 factors 2013-11-04, to get printable copies of the puzzles below and last Monday’s answers. 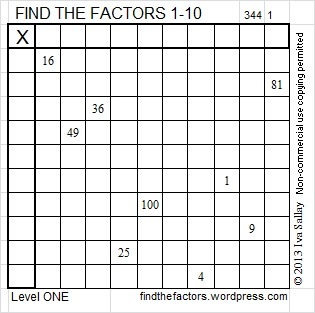 To solve the puzzles, place the numbers 1 – 10 in both the top row and the first column so that those numbers are the factors of the given clues. 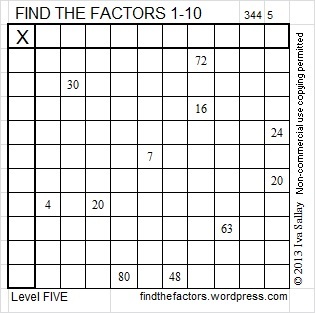 Obviously level 6 is more difficult to solve than level 1.